Our company has many years experience in manufacturing industrial springs made of stainless and acid-resisting spring wires. We offer products ranging in diameter from 0.2 to 6 mm, made using state-of-the-art CNC automatic machines. -form springs of various types, including cotter pins, rings and fittings. 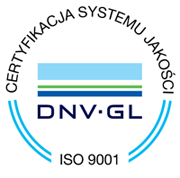 As a result of using proven technologies, and the attention which we pay to each detail in our products, we have been able to cooperate with companies from the automotive industry, manufacturers of electronic and electrotechnical equipment, refrigerating automatics, the furniture industry and many others, for a number of years. The company, SPRING-WAD, represents high quality products and attractive prices - owing to this we are one of the leading manufacturers in this sector.